I recently had the vegetarian lettuce cups from PF Changs and wanted to try and recreate them at home. 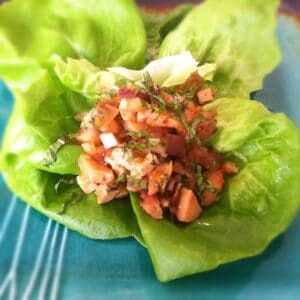 I forget how much I love lettuce cups, they are such an easy way to throw-together dinner with whatever is in your pantry. These have a bit of heat in them so feel free to scale down the peppers to your liking. I know it sounds like a lot of ingredients, but you are using the same ingredients over again in different places. Mix together the first set of sauce ingredients and toss with the bamboo shoots, water chestnuts, and tofu. Allow to sit for 5 minutes while you heat a large pan/wok over medium heat. Add the red onion, scallions, chili peppers (if using), and garlic. Stir fry with water or 1 tbsp. sesame oil and cook for 5 minutes until onions are soft. Add the tofu mixture and stir together. Meanwhile, combine the cooking sauce ingredients. Whisk together to combine and add to the pan. Stir together and cook for 10 minutes. Wash and clean the lettuce. Place a scoop of the mixture into the lettuce cup and devour! 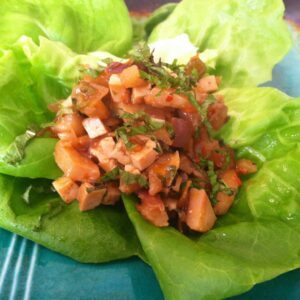 What are your favorite restaurant recipes that you would like to see made over? Sounds ymmy, I love PF Chang’s lettuce cups and will try these for sure. Thanks for the suggestion.